All New Show! Adults $42.95; Kids $24.95. use Code: 112VMB. Medieval Times is an exciting, family-friendly dinner attraction inspired by an 11th century four-course feast and tournament. 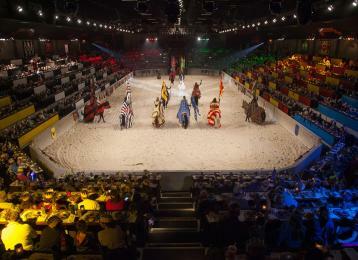 This 2 hour live performance includes pageantry, falconry, magnificent horses, authentic sword fights and jousting all while you enjoy a “hands-on” four-course feast in a fully enclosed, climate controlled arena!